Day 29 of the 2016 World Series of Poker was scheduled to see four winners of gold bracelets, but only three were handed out when the dust had settled and the final bags of chips were carted out of the Amazon Room. Two stars, one a newer face and one an established legend, were among the big winners, while Jason Mercier has a nice stack in yet another $10K event. All summer long, PokerNews.com will be bringing you daily coverage of the 2016 WSOP, brought to you by our sponsors, 888poker. Detroit native and University of Georgia economics grad Ankush Mandavia won the 2016 WSOP Event #48: $5,000 No-Limit Hold'em title on Wednesday. A former online heads-up specialist touted as one of the fresh new stars of the game by players like Daniel Negreanu, Mandavia collected a career-best $548,139 in first-place prize money and his first WSOP bracelet for the win, defeating a tough final table that included record 14-time WSOP bracelet winner Phil Hellmuth. Mandavia discussed his breakthrough win in an article posted here. Hellmuth spoke with PokerNews about his 53rd WSOP final table appearance and his confidence going forward in an article that can be found on this page. John “Johnny World” Hennigan joined the ranks of four-time bracelet winners by taking town Event #47: $10,000 2-7 Triple Draw Championship for $320,103. And he only did so because he needed a breather from high-stakes cash sessions that have kept him beaten down of late. Plenty of tough competition stood in the way of Hennigan and bracelet No. 4. Even on Day 3, with just nine players in contention to start the day, the likes of Abe Mosseri, Viacheslav Zhukov, Chris Klodnicki, and JC Tran populated the field. And by the time Hennigan navigated past that gauntlet, he only had fellow three-time bracelet winner Michael Gathy to contend with. Yet Hennigan persevered, earning his first bracelet since winning the Poker Players Championship in 2014 for just over $1.5 million. Florida-based poker pro Steven Wolansky, 28, won his second WSOP bracelet on Wednesday, getting the best of a massive 2,076 player field in the 2016 WSOP's latest $1,000 No-Limit Hold'em event. Wolansky earned $298,849 for the win after returning for the event's unscheduled fourth day Wednesday to finish off a heads-up match for the tile with eventual runner-up Wenlong Jin. "My next goal is to just to keep doing what I am doing, to learn from what I’m doing, to play well, and to have fun," Wolansky said. 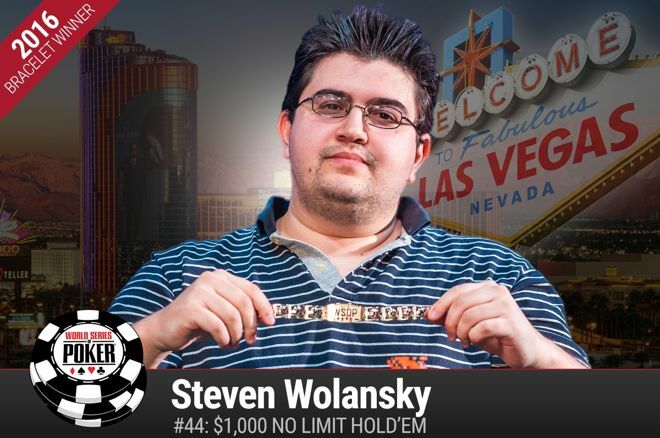 Wolansky first bracelet came in a $1,500 2-7 Lowball event in 2014. "This win is just as meaningful, if not more," Wolansky added. "The first one I won was more about me wanting to avenge my second-place finish the previous year. "But this time, it was a lot more money and plus the odds I had to overcome." Wolansky started the heads-up match on Thursday even with Jin, but overran him quickly and decisively. A fourth bracelet winner was supposed to be crowned Wednesday, but things didn't shake out that way in Event #46: $1,500 Bounty No-Limit Hold'em. Instead, three players will return Thursday to tangle for $290,768 and a bracelet. Two of them, chip leader Kristen Bicknell (7,080,000) and second-place Norbert Szecsi (5,600,000) already have WSOP gold to their names. The third is American John Myung (3,550,000), a long-time WSOP grinder with $568,408 in cashes at the series dating to 2004, including a slew of final table appearances. Bicknell, a Canadian, won the Ladies Event in 2013 for $173,922. Szecsi, a Hungarian, won a $1,000 No-Limit Hold'em event, also in 2013, for $345,037. The day began with 36 runners, and Will Failla, Sebastien Comel, Steve Gee, Jared Hamby, Matt Stout, Calvin Anderson, Mike Kachan, and Joe Kuether all found themselves at the payout desk by day's end. Level 32 (80,000/160,000/20,000) will be in the offing when play resumes at noon Thursday, and this time a winner will surely be crowned. Eugene Katchalov won his first and only WSOP bracelet back in 2011, taking down the $1,500 Stud for $122,909. Now, he's looking to repeat the feat as he bagged the chip lead heading to Day 3 of this year's event. Katchalov still has plenty of work to do with players like Shaun Deeb, Adam Friedman, John Monnette, and double 2015 bracelet winner Max Pescatori in contention. Day 2 began with 69 players and 50 spots paid. Among those making the money were Doug Lee, Brandon Cantu, Matt Grapenthien, Naoya Kihara, James Obst, and Robert Mizrachi. The tournament gets back underway at 2 p.m. with limits of 12,000/24,000, and a winner is scheduled to be determined. A highlight of the WSOP schedule each summer is the $10,000 Pot-Limit Omaha Championship, and this year's turnout was 400 players, a bit stronger than last year's 387, creating a prize pool of $3.76 million. Of those, 159 made it through Day 1, with Germany's Steven McCuller's 498,600 leading the way. Jason Mercier, who got second in this very event last year and is stealing headlines throughout the poker world with his excellent performance this summer, also booked a ticket to Day 2 with 218,800, good for 20th on the leaderboard. The field is filled with too many big names to count, but Rep Porter (293,700), Michael Mizrachi (276,900), Christopher Kruk (263,800), Joseph Cheong (224,800), and Harley Stoffmaker (219,000) also bagged in the top 20. Everyone who still has chips will return Thursday at 2 p.m. for another 10-level grind, and with 60 players paid, the money will be reached at some point during those 10 levels. The 2016 WSOP Event #50: $1,500 Shootout No-Limit Hold’em capped out at 1,050 players on Wednesday. They played down to just 120 remaining with well known players including Vanessa Selbst, Eli Elezra, Sam Greenwood, Brian Hastings, Nam Le and 888poker Ambassador Sofia Lovgren still in the mix. All 120 players returning for Day 2 Thursday are guaranteed a payout of $4,955 and a seat in one of 12 ten-handed tables. The winners will advance to two final tables of six on Friday that will combine for the final table when 10 players remain. The winner will earn $264,046 and a WSOP bracelet. Play resumes at 12 p.m. Thursday. In addition to all the other action above, the 2016 WSOP Event #52: $3000 No-Limit Hold'em begins at 11 a.m. local time, and Event #53: $1500 Mixed PLO/8; Omaha 8; and Big O, featuring a rotation of Pot-Limit Omaha 8 or Better, Omaha 8 or Better and Big O, starts at 3 p.m.
As the 2016 WSOP rolls on, be sure to stay tuned to PokerNews for continued coverage, brought to you by our sponsors, 888poker. Get all the latest PokerNews Canada updates on social media. Follow us on Twitter and like us on Facebook!